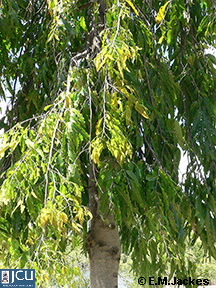 This tree, a native of India and Sri Lanka has been planted along a number of streets in Townsville as well as on the campus. 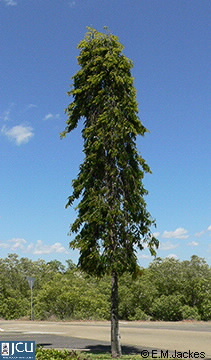 It is readily recognised by the pendulous branches resulting in a symmetrical pyramidal growth and by the shiny leaves with their wavy margins. The small flowers are pale green and relatively inconspicuous. The indehiscent fruits are borne in clusters of up to about 20, purple or black when ripe. They are eaten by birds particularly the Koel, as well as by bats. This tree is also known as Asoka or Ashoka but these common names are more typically applied to Saraca indica a tree with a spreading habit and clusters of orange flowers in the Fabaceae; Caesalpinioideae.